There were 8 players from the top-50 in the field last year so another decrease this year. The last time this event was played in March was in 2015, there were 18 top-50 players in the field. The field includes 5 past champions: Andrew Landry (2018), Charley Hoffman (2016), Jimmy Walker (2015), Martin Laird (2013) and Brendan Steel (2011). A perfect way for fantasy golfers to check on the past performance of all the players in the Valero Texas Open field is our performance chart listed by average finish. Another way to check who is the best is through a special formula worked out in Golfstats that gives us the best average performances at the Valero Texas Open in the last five years or check out our sortable 8-year glance at the Valero Texas Open. The Valero Texas Open is a historic tournament; it’s the 6th oldest professional tournament in golf worldwide, the 3rd oldest on the PGA Tour and the longest held in the same city. In 2012, the competition celebrated its 90th anniversary. Dating back to 1922, the tournament has been through 16 names to date, but it can always trace its lineage back to San Antonio, Texas. As for host courses of the Valero Texas Open, the event has predominantly been hosted by the Brackenridge Park Golf Course, the Willow Springs Golf Course, Fort Sam Houston Golf Course, Oak Hills Country Club, and between 1995 and 2009, The Resort at La Cantera. Eight years ago they moved to the new TPC San Antonio, which is part of a two-course project. AT&T Oaks features a course rating of 76.5 and a slope rating from the back tees of 148. The tees, fairway, and rough are Bermuda Grass but different strains, Emerald Ultradwarf on the tees, TifSport on the fairways, Champion Ultradwarf on the greens and Bandera in the rough. The course is part of a resort and is open to those that stay on the path, and it’s members. The average green size at AT&T Oaks is 6,400 square feet, which is a little over the average on the PGA Tour. It has 58 bunkers and water that comes into play on 3 holes. Last year the course played to a 72.37 average, the 12th hardest course on the PGA Tour. In 2017 the scoring average was 72.85, and it was the 10th hardest course on tour. In 2016 the scoring average was 72.21 and was the 17th hardest course on tour. In 2015 it was 74.52 and the second hardest course on the PGA Tour. In 2014 the TPC San Antonio was the 8th hardest course on the PGA Tour playing to a 73.286 average, playing a shot and a quarter over par. In 2013 the TPC San Antonio was the 15th hardest course on the PGA Tour playing to a 72.740 average playing .740 stroke over par. There wasn’t anything wrong with LaCantera, the reason for the move is financial because the event now doesn’t have to pay a site fee which has been reported in the $300,000 neighborhood. The course being used is the AT&T Oaks, which will play at 7,435 yards and a par 72. It was designed by Greg Norman with Sergio Garcia as the player consulted. The course opened in 2009 and is one of the 12 TPC course that will be used on the PGA Tour this year. Let’s take a look at vital stats that are important for those playing in TPC San Antonio. 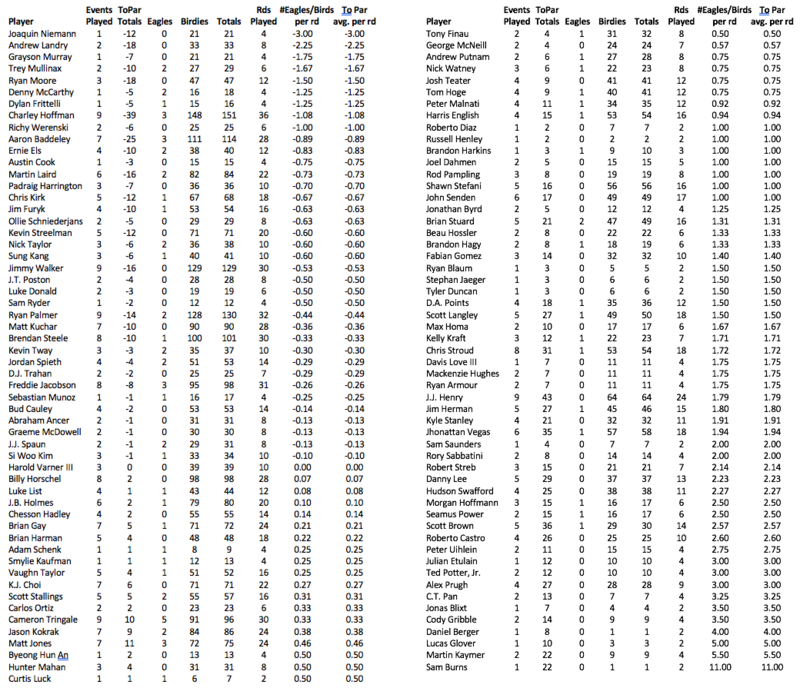 This is based on the most important stats for TPC San Antonio, based on data from last years Valero Texas Open, and using data from all the players in the field with stats from 2019. What we do is take their rank for each stat and then add up the four categories. The scoring average of the field at TPC San Antonio in 2018d was 72.37 so with par being 72 the course played just a shade over a quarter of a shot a round. Last year the course was the 12th hardest course on the PGA Tour in 2018. In 2017 the course played 72.85 making TPC San Antonio the 10th hardest course to score on in 2017. In 2016 the course played to a 72.21, or a quarter of a shot over par, making it the 17th hardest course to score on in 2016. The previous year, 2015 it played to a 74.52 scoring average making it the second hardest course for that year on the PGA Tour. In the history of the PGA Tour, it’s one of the highest scoring averages for a non-major so it’s important to note that all the players will be tested this week. The reason for high scores in 2017 was winds that blew between 10 to 30 mph all week, with Saturday having the hardest day. Last year the winds were between 10 and 20 mph, a lot calmer. So if winds are high, the scores will be high. But the tournament is being played three weeks early so for this week all four days the winds will be below 10 mph. Showers will be around most of Saturday but the other three days will be nice and each day in the mid-80s. TPC San Antonio has been and will be one of the toughest courses the tour will see this year. Hitting it hard and far is important, last year it ranked 23rd out of 38 courses in driving distance on all drives. So with an average driving of 288.7 players will be hitting it hard and not laying up. You can see those results in fairway accuracy, the course was 19th on tour last year with 58.02 average, so it’s very important to place drives in the fairway. Last year the course was 9th in greens hit which is very high probably because of all the wind. It’s also something that is expected on this course in past the greens have been very tough to hit, in 2017 it was 3rd, in 2016 it was the 15th hardest, in 2015 it was the 2nd hardest greens to hit on tour, and the between 2012 and 2017 all the winners were in the top-17 in greens in regulation with last year’s winner Andrew Landry, 2015 winner Jimmy Walker and 2012 champion Ben Curtis leading that stat. So our first key stat is strokes gained Tee-to-Green because you have to do well in this stat to win. Last year the course ranked T-6th in that stat, with winner Landry ranking 1st while 2017 champion Kevin Chappell ranking 2nd in this stat, 2016 winner Charley Hoffman was 10th in this stat and 2015 winner Jimmy Walker was 3rd. Just like we have seen the last couple of weeks on tour, if you miss fairways you have to scramble well, last year TPC San Antonio ranked 23rd in scrambling on tour, meaning that the pros were able to get up and down when missing greens. Last year Andrew Landry was 2nd in scrambling getting it up and down in 15 of the 19 greens he missed. Another important item in doing well is putting, last year the course ranked 10th in making putts from ten feet and in with 86.82 average. Again in looking at our profile of Landry, he ranked T-10th in this stat making 66 of 72 putts from ten feet and in. Last is birdie average and it’s hard to image but the players only averaged making 3.41 birdies per round. That ranked it 15th on tour, while Landry won making 21 birdies for the week, a 5.25 average. *Strokes Gained Tee-to-Green: Stat is a great barometer on how players games are from tee to green, taking a combination of driving distance, driving accuracy, greens hit and proximity to the hole. *Putting inside 10 feet: Very easy, counts every putt from ten feet in to see who makes the most. Click any column title in the table header to sort columns. With a weak field, that means DraftKings has to take guys that you would possibly be picked do to their marquee value and put them a high price. A perfect example is Jordan Spieth at $10,300. Picking Jordan at that price is like paying to take a ride on the Titanic, not a great move. If you can figure this out, then you will have an advantage because you will have a lot of people that go off at a cheap price. Example of that, last week’s winner in Dominican Republic Graeme McDowell at $8,800. Or how about Lucke Donald who played great at Valspar two weeks ago, you can get him for just $7,300. Or even better how about Chris Stroud going off at $7,100 he was T-2nd last week at the Corales Puntacana. So let’s look at the top of the barrel and the reason you don’t want to take them. Right off the bat, Rickie Fowler at $11,700 is a terrible pick. He has no track record on this course and he has not played that great in his last two events, so it’s best not to take him. Now Matt Kuchar at $11,200 is a lot of money but he has some good moments on this course and comes in playing great. So if you want to spend a boatload of money ok, I can see him getting you some points. Tony Finau at $10,800 could be ok, he was T-3rd last time he played on this course and his game is showing some signs of life, you could catch lightning in a bottle with him. How many words does it take to say no on Jordan Spieth at $10,300, don’t think anybody would disagree with me. Sungjae Im at $10,100 is a big gamble, yes he hits it straight, can scramble and putt and make birdies, the only disadvantage has never played in this event. Still, he is ok to take. Also, Billy Horschel at $9,800 could be a great pick. Has some good history on this course with a T-11th last year, T-4th in 2016, 3rd in 2015 and T-3rd in 2013. For the year is making cuts and looking for that one consistent week of golf. Jim Furyk at $9,600 is also a good possibility. Has played good of late, has played well at TPC San Antonio. Only thing I don’t like, will be playing his fourth straight event and fifth in the last six weeks he has to be tired. But I think he knows he is playing well and would like a shot at winning and getting him back tot he Masters. Now Jason Kokrak at $9,400 has problems and some good thing. He isn’t a good putter, is good from tee to green but between his past record in this event and the fact that he was T-2nd in his last start at Valspar will have a lot of people going for him. I say toss that coin and let the flip make up your mind. Lucas Glover is $9,300 and I just don’t think he is worth the money, yes he is making cuts but not really contending. Can someone at DraftKings tell me why Byeong-Hun An is at $9,200. Yes, he was T-10th at the Palmer last month, but lost two out of three matches in Austin, plus has no record in this event, I say no. I can see why Ryan Moore is $9,100, that is because he was 7th last year in this event and frankly the course is good for him. But he has struggled this year so I say no. Have to also say no to Lucas Bjerregaard at $9,000. Sorry his stats are tough for this kind of course and yes he made it to the consolation match and beat Tiger Woods but the princess turns into a pumpkin on Thursday morning. Abraham Ancer is one to watch at $8,900. Has played well of late and has all of the stats for the year to mount a good offensive. Yes, he hasn’t been great in his two starts in this event, but he shows lots of promise. Graeme McDowell is $8,800 and looked good in his win. The only problem of McDowell’s four wins in America, they are all along a body of water and the last time I checked, TPC San Antonio is landlocked, but he could still do ok. Like Ryan Palmer at $8,400, he plays well at TPC San Antonio and was T-4th at Honda wedged in between missed cuts at the AT&T and the Players. I took Charley Hoffman in this event in 2016 and was very happy with his win, this week he is $8,200 and despite his struggles, this year could surprise us with a very good week. Talking about guys with good track records at TPC San Antonio is Jimmy Walker at $7,800. His stats for the year aren’t very promising, but you never know if the return to a place he has success on will turn his game around. Andrew Putnam at $7,600 could be good, yes his game isn’t blazing but the last couple of winners in this event also wasn’t blazing coming into their tournament. *Are there any “Bargains” out there? Joaquin Niemann is at $7,600 and I just wonder whatever happens to his game, just think that maybe a return to a place he did well in, (finished 6th last year) could put a spark into him. Like Luke Donald a lot at $7,300, the guy played well at Valspar and I think he continues the good play. Same with Dylan Frittelli at $7,300, has played solidly of late and was T-20th at this course last year. A past champion that could do you good this week is Martin Laird at $7,000, he always plays solid at TPC San Antonio and despite a run of three missed cuts could bounce back. Looking for that cheap bridge to get you some points while making the cut, look at Brian Gay at $7,000, he won’t disappoint you. Another cheap player is Ernie Els at $6,800. Finished T-3rd the first year TPC San Antonio opened he has played great of late including a T-7th in Malaysia two weeks ago. For the regulars of past Valero Texas Open’s, nine years ago was the start of the new era here. For players like Zach Johnson, who won twice and Justin Leonard, who won three times at LaCantera, it was an unpleasant experience as Leonard has not finished better than T30th in eight tries while Johnson missed the cut in 2010 but did finish T6th in 2014. In looking at the performance stats from 2010 through 2018 hitting greens seemed to be the key for many in the top-ten. Last year the course was 9th in greens hit while in 2017 it was 3rd. In 2015 it had the 2nd hardest greens to hit on tour at 51.73%. In 2014 it had the hardest greens to hit on the PGA Tour as only 55.24% of them were hit. That has been the buzz about the course, in its nine years on the PGA Tour it’s never been above 7th ranked in Greens Hit, until 2016 when it ranked 15th, and that was probably because of the easy weather conditions. On the other realm of the spectrum, TPC San Antonio does have the easiest greens on tour to putt. Last year it ranked 42nd, in 2017 it ranked 44th, in 2016 it ranked 39th in putts per round, in 2015 it ranked 38th out of 51 courses on average putts and putts per round with an average of 28.52. The course ranked 42nd last year in most one putts of any course on tour with a 41.65 average. Combination of that tells us that a player needs to hit lot’s of greens and putt well. In looking at the eight winners at TPC San Antonio, all of them ranked in the top-20 in both greens hit and # of putts (all except for Brendan Steele in 2011 ranked T40th in greens hit, last year Kevin Chappell ranked T-36th in putts). Unimportant stat: With the course being new in 2010, it made sense with wins from inexperience winners like Brendan Steele, Martin Laird and 2014 winner Steven Bowditch. But Andrew Landry won last year, Kevin Chappell won in 2017, Charley Hoffman won in 2016 and Jimmy Walker won in 2015, Adam Scott won in 2010 and Ben Curtis in 2012 so the players should know the course by now but look for a non-marquee guy to win. Since TPC San Antonio joined the PGA Tour in 2010, it has never been out of the top-20 of toughest courses on tour and been in the top-ten four of the last seven years. One trend that is pretty unique at the Texas Open is the fact that 3rd round leaders tend to rule the roast. Since 1988 the 3rd round leader has won 22 of the 31 tournaments so if you are looking for a neat bet with someone, bet the 3rd round leader to win the championship. Since moving to TPC San Antonio in 2010 six of the nine winners have led after the third round, last year Andrew Landry and in 2017 Kevin Chappell both led going into the final round. Look for the course to play tough, with thick rough and tight fairways that will play havoc on the players. Hitting it long doesn’t cut it at TPC San Antonio, of those that have finished in the top-3 only six have been in the top-ten in driving distance. So this is a course that power won’t dictate a win. Fifteen previous Texas Opens have been decided in playoffs, the last coming in 2009 when Zach Johnson defeated James Driscoll. So there hasn’t been any playoffs yet at TPC San Antonio. In looking at the long-range weather forecast It will be cloudy every day with early thunderstorms on Thursday and scattered Thunderstorms on Saturday. The big news for the players, it will not be windy this year as no day sees winds higher than 10 mph. Playing the best of anyone, may not have the best of records at this event but should be able to win on the course. Was T-3rd last year, his game is still a bit rusty but getting better. Is the horse for this course, just needs that one consistent week. I like him a lot this week, he is the type of guy that always seems to win this event, has played well of late. Just don’t know which Rickie Fowler will show up and if he has a chance on this course, playing the event for the first time. Just hope he has enough left in the tank for another good week. Would love to win this week and be able to play in the Masters. Always plays well at TPC San Antonio. TPC San Antonio is right up his alley, just hasn’t played well of late. Showed some heart last week, just wonder if he can be consistent on this course for four rounds. Become more of a name in America, showed he could play at the match play. Another of those that have played well on this course, hasn’t played that great this year. Great to see him back in the winners’ circle again, his good play could carry over to this week. Seems to have his game back into shape, course should suit his game. A bit disappointed on how poorly he has played in 2019, played great in this event last year, maybe the happy memories will get him going again. Guy has played solidly of late. His game doesn’t seem to be improving, don’t see it happening this week or next at Augusta.